Perception of Syrian conflict defined by baseless "activist" statements. Bangkok, Thailand July 10, 2011 - According to Fortune 500/Soros-funded Human Rights Watch whose sponsors represent a corportocracy that has been attempting to breakdown and despoil Syria for decades, anonymous Syrian soldiers who defected and are now living abroad have "claimed" that they were ordered to "shoot to kill." According to the Qatari propagandists at state-owned Al Jazeera, one of the "interviewees" told HRW that their "superiors had told them that they were fighting infiltrators, salafists, and terrorists, but were surprised to encounter unarmed protesters instead." Of course, not a shred of evidence exists to back any of these claims - just Human Rights Watch's "good" corporate-funded word, and the slick graphics of Al Jazeera along with the $500 suits worn by their correspondents in their multi-million dollar studios. Al Jazeera, it should be remembered, is state-owned by the government of Qatar - the same government shipping weapons to Libya's Benghazi rebels in support of NATO's military campaign, in direct violation of their own contrived UNSC r.1973. It is quite clear that their insistence on reporting unverifiable, slanted news, in favor of yet another Western-backed destabilization constitutes their current modus operandi. For months now, Syria has been destabilized by admittedly US funded "activists" and groups of militants responsible for the death of hundreds of Syrian security forces. An April AFP report titled, "US trains activists to evade security forces," admits that indeed the US is funding, equipping, and training armies of activists to effectively rise up and topple their governments. Michael Posner, the assistant US secretary of state for human rights and labor, said that $50 million had been spent on training up to 5,000 activists, and one particular gathering that included activists from Tunisia, Egypt, Syria, and Lebanon who would then go back and create a "ripple effect." The "ripple effect" of course is the foreign-funded sedition unfolding across Syria today. Most likely, the militants battling Syrian security forces are being drawn from the ranks of Syria's Muslim Brotherhood. The Muslim Brotherhood is an organization almost as omnipresent as MI6 or the CIA and coincidentally is working in tandem with other US-funded "youth activists" across the region. The Muslim Brotherhood's history in Syria goes back decades. According to a Brandeis University publication titled, "The Syrian Muslim Brotherhood and the Assad Regime," in 1979 the Brotherhood, also called the "Ikhwan" attacked and massacred 32 Syrian military cadets. This was part of a larger campaign of violence conducted by the Brotherhood which also included assassination attempts against the Syrian president. 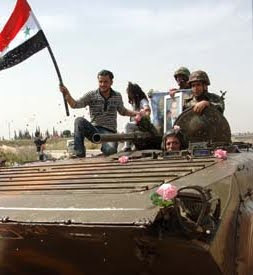 The escalating campaign of violence was the primary impetus for their cornering and destruction at the hands of the Syrian military in the city of Hamah in 1982. After their cornering in Hamah, many members fled Syria and the organization is now based in London. They have recently voiced their backing of the Syrian protests but their official role on the ground and abroad remains unclear. Reports have come out that armed militants have been attacking both protesters and Syrian security forces in an attempt to escalate violence and bring the crisis to "critical mass," resulting in either the toppling of the Syrian government, or an opening for foreign military intervention. While the corporate-owned media cites anonymous, mystery witnesses making otherwise baseless claims, the Syrian government has been releasing footage, photographs, and alleged confessions from captured militants identified as Muslim Brotherhood members. A recent Al Jazeera news clip, while attempting to portray such claims as mere government propaganda, did provide footage of a car full of what was thought to be activists suddenly pulling out weapons and indiscriminately firing in all directions. Video: Syrian state television claims armed members of the once prolific and very violent Muslim Brotherhood are working amongst the protesters, killing activists and security forces alike to escalate violence and increase the nation's instability. After admittedly funding and training opposition groups within Syria to rise up and attempt to topple the government, and with violence amongst the opposition becoming increasingly difficult for the corporate-owned media to cover up, articles such as the Christian Science Monitor's "Has Syria's peaceful uprising turned into an insurrection?" are attempting to spin coming revelations that the protesters were in fact armed insurgents all along just as they had been in Libya. Of course, Syria's mobilization of entire armor divisions and military aircraft would not be necessary if protesters were merely carrying placards and chanting slogans. The obvious gap in the corporate-owned media's coverage of Syria is an accurate description, or even fair mention of the armed elements operating amongst the protesters. Such a gap in coverage is meant to give the illusion that the Syrian government is unjustifiably using violence against its own people and has thus, “brought it on themselves” in regards to increasing sanctions, additional foreign aid rendered to seditious forces within their borders, and a possible "Libyan-style" intervention. Such a concept of "bringing it on themselves" was spelled out verbatim in regards to neighboring Iran in the corporate-funded Brookings Institution "Which Path to Persia?" report, illustrating undeniably the premeditated, diabolical nature of the current Syrian unrest and how much in lock-step the corporate-media is with the global corporatocracy in executing this operation.